Speaking of big signals please take a look at the following two screenshots. The left one shows the really wide signal of OH5Z around 7z while the right one shows the much cleaner signal of OG55W. 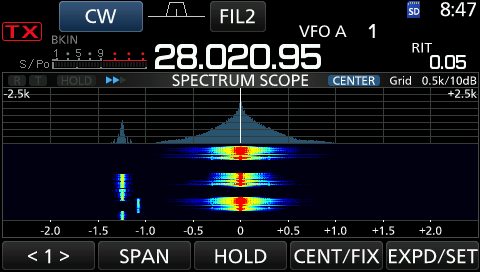 Both were about equal signal strength, i.e. s9 plus a bit indicated by the red colored carrier lines (this was important to have a clean base for comparison not to draw any wrong or unfair conclusions). At 10:20z SP4Z spotted AH2R, Guam in the Pacific, as being “strong” from almost 12.000 km away from here! And lo and behold, I could really hear him, too! 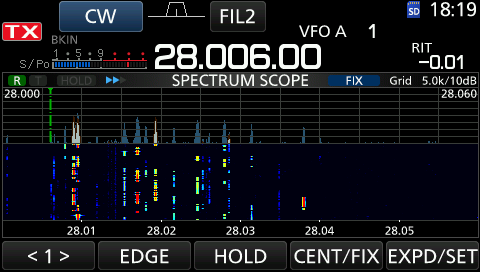 Unfortunately he was too weak for a QSO, i.e. he didn’t hear me, but then it was still quite fascinating and showing again the magic of 10 m (although 6 m is the official “Magic Band”, hi). It shows how well the path westwards (at least the first hop) was open which also enabled QSOs with 8P5A and FM5BH as additional unexpected Caribbean DX contacts. 🙂 The lefthand screenshot shows band activity around 18:20z. 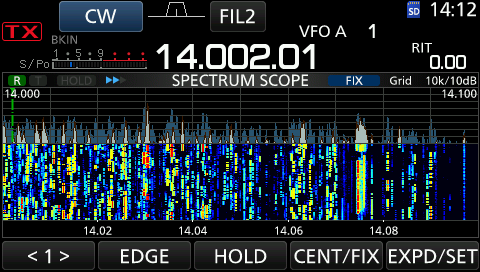 It’s not that much about the number of signals but signal strength’ (from blue = weak over yellow to red = very strong). 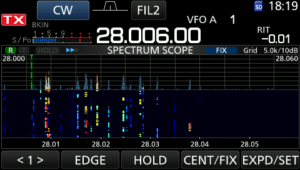 The band closed at 20:30z with both EA1AER and EA5AER coincidentally worked “in a row” (well, actually 10 minutes apart) as the last two stations on Saturday. 😉 My 10 m log counter showed 270 QSOs, not too bad for the first day with such low activity on the band and long phases of no propagation. 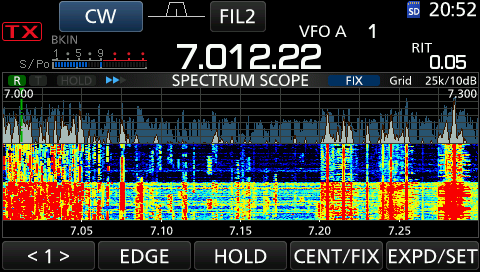 Did a few more QSOs on the lower bands before I finally called it a day around local midnight. Early up Sunday morning again but band still closed. First signs of activity around 6:30z into the Southeast, i.e. UA6 as well as Sicilly again (Good Morning Guiseppe! ). Overall the morning was rather unspectacular, only 50 QSOs until the band closed again at 12z (Déjà vu from Saturday, eh?). The later the evening the better the DX was certainly true for Sunday night. Until local midnight a few more DX stations from PY, LU & CE as well as PZ5XX, YV4ABR, HK3C, HC2GRC and P4/W1XP made it into the log with a few more heard (but worked on Saturday already). L-t-r: YV4ABR; me (green marker = my frequency) having just worked G4CXQ for the second last QSO; FM5BH & YW4D, both still strong around local midnight before the band finally faded. The dedicated hardware buttons for certain functions on the K3 might make it easier in the one or other situation, too, although the touch screen makes up for the little front panel real estate of the 7300 quite well with important functions reachable on a simple screen press, too. 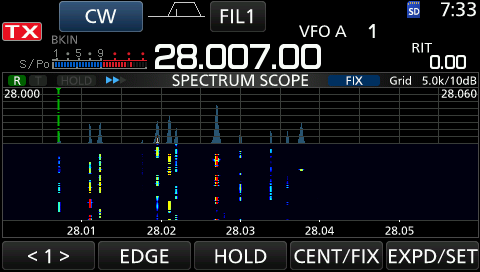 After all this is just a matter of taste … I really liked the spectrum display of the 7300, it helped jumping directly onto new signals popping up. The K3 combined with a P3 can do the same but then it’s more hardware, more cabling, more hassle & more space (the reason I sold my P3 … I have to install the station from scratch everytime I want to play radio locally here). And more money, of course (the P3 adds another 800 EUR to the K3)! 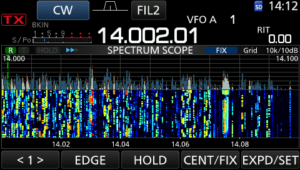 So I wish Elecraft would come out with a “K4” which has all the P3 functionality included. Really. This entry was posted in Audio recordings, Contesting, Equipment, Propagation, Sporadic E. Bookmark the permalink.